Following the acquisition of RAKO Products Ltd in 2009 the company was re-branded to Miniveyor Products Ltd. With offices on 4 continents, we serve a global customer base. 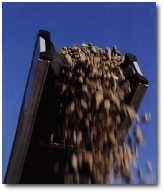 The easy-to-operate Miniveyor conveyor is currently being successfully used worldwide in a multitude of applications. 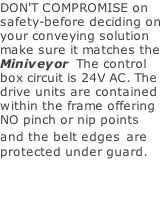 The original Miniveyor system is a proven design so why compromise on quality or safety. When you are purchasing a modular conveyor system make certain it carries the Miniveyor brand.